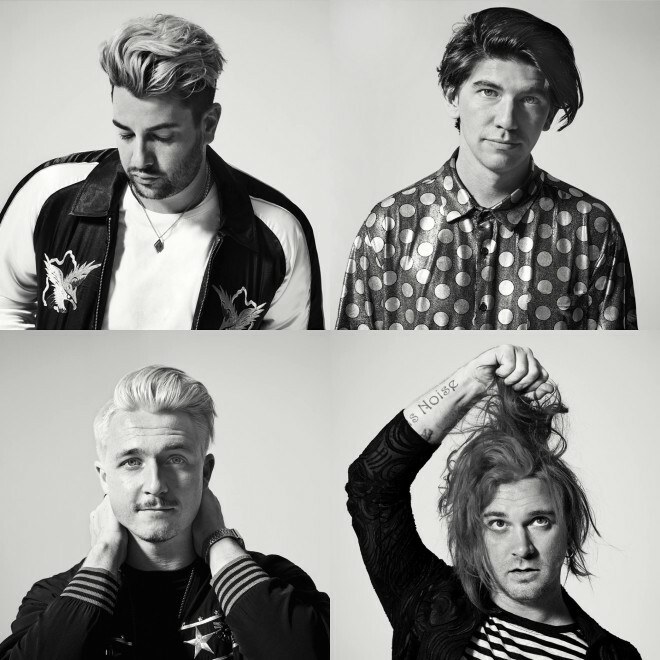 On November 11th, Aussie indie rockers The Griswolds become Aussie electronic, R&B, pop artists The Griswolds, with the release of their genre-bending new record, High Times For Low Lives. A staple of the indie rock scene since 2014’s Be Impressive, the quartet has taken a risk by going in an entirely new musical direction. We got to chat with frontman Chris Whitehall about the new record and how it will change their live show. This new album seems like a departure from your traditional indie rock vibe. What made you think that going in a more electronic/pop/disco direction was the right thing to do right now? Chris Whitehall: I don’t think we really thought about it as the right thing to do or the wrong thing to do. I think it was was just the right thing for us. We didn’t necessarily go into it thinking “hey, we should sound like this.” I think we were more just sick of the indie rock sound. I think so many bands are doing it now, there’s just this huge ocean of indie rock bands. We didn’t want to be a little drop in that ocean, we wanted to stand out and make a sound that we think is more inventive and creative and something that we love. We went into it with that mentality and came out of it with what is now our album. Why did you choose to include interludes? What’s the function of an interlude for you? CW: It kind of helps tell the story a bit better. Even when I look at our first album Be Impressive, it’s just eleven songs back to back. There’s nothing wrong with that. We wanted to tell more of a story with this album and take listeners on more of a journey. Ups and downs, upbeat and slow. We’re really influenced by some albums that did put interludes on there and had all kinds of strange things going on at the end of songs. We fell in love with that. How it takes your head into a different space for a second and brings you back. For us, it really helps tell the whole story of the album. One of the albums that I can think of that’s done it best is Currents by Tame Impala. And To Pimp A Butterfly by Kendrick Lamar. Both of those albums have done it really, really well. There’s a pretty serious disco influence on this album on a lot of the tracks. Where does that come from? Is it disco to you or just a turn towards groovier music? CW: It’s definitely groovier music. A lot of the influence on the drums, when we were writing the drums, came from Motown. There’s a lot of R&B and hip-hop beats as well. I feel like it kind of started out with the drums and when you put Prince-esque stuff into Michael Jackson sounds it’s gonna be pretty hard to avoid it sounding like an 80s disco party. There’s such a whirlwind of different genres we all love in this band, and it definitely went into the songwriting. When you just gel them all together, it came out like this funky, Motown, disco sound with hip-hop beats and modern, current-sounding melodies and lyrics. It sounds like a Michael Jackson album in 2016. CW: That’s pretty much the biggest compliment you could give us. That’s what we were trying to do. We wanted to make something a bit more classic sounding. Not something you’ve heard before, but something that makes you feel like you’ve heard it before. And bringing this classic-style sound into a modern world. Tell me about how the collaboration with Lizzo came about. We were so worried about who would do that feature and she came in and just slaughtered it in ten minutes. She was perfect. We just fell in love with it. It was the first thing she put down. Which of the songs on this record was the easiest to write? Which was the most difficult? CW: “Birthday” was a really, really easy one to write. We were just in the right vibe. It was also the first song we wrote. Your creativity is there and flowing and you’re ready to hit it. All of the lyrics, melodies, sounds everything just came out on that. “Out Of My Head” was kind of similar to that, too. The hardest to write was “Looking For Love” and “Feels So Right.” With those two, I was trying to finish up lyrics and melodies while we were in the studio. I was so zapped. I was so dry, creatively. I felt like I really couldn’t bring anything else to the table, like I was done. I went on a five-day camping trip out in the mountains in Los Angeles with me and just a few select friends and found my creativity back up there. Can you tell me about the influence that working with producer Andrew Dawson had on this record? He’s just so free in the way that he produces music. It was the perfect combination for us. We just had no rules, he said “anything goes.” We just went for it. How do you think this new album will change your live show, considering it has a very different vibe and probably different technical requirements than your previous albums? CW: I think the guys are going to have to get singing lessons, for one (laughs). Because there’s so much more backing vocals and singing on this album. So many more reasons for the guys to be singing. I think Tim, our bass player, might even have to get a keyboard from now on so that we have two keyboards on stage. Which will be interesting, but I think really cool. We’re just going to have to adapt to what the new songs are demanding from us. Whatever is going to make the live show, whatever’s gonna tell the story of the album in the best way. We’re going to do that and make the band adapt. We’ve never restricted ourselves to being a rock band with two guitars, drums and bass. We’re only slaves to what the music wants us to do. What is the story of this album to you? CW: The story is so much about experiences and sacrifices and relationships. Kind of what you lose from giving everything to what you love and what you gain from giving everything to what you love. In this case, the band and being on the road and how we’re so much in love with what we do but how that sometimes comes with real sacrifices. Loss of friends, loss of loved ones. Loss of morals. Which is where we came up with title, High Times For Low Lives. Sometimes we are just low lives and make horrible decisions. The main factor here is learning from those things. And experiencing life. The Griswolds’ High Times For Low Lives is out November 11th on Wind-Up Records.